Avoid RSI, gain productivity and increase your IQ. In the above picture, you can see that I have a mouse on the left side of the keyboard, and a mouse/tablet stylus on the right. When you sit at the keyboard, the center of your body should be centered between the ‘G’ and ‘H’ keys (or where the grey area is on the Palm rest).The mouse on the left is roughly where the numeric pad on the right is sitting with respect to how your arms will usually lay. The mouse on the right is out far enough that it will cause you to need to hold your arm out further from your body than is normal for a “resting” position, which can lead to RSI’s in the shoulder. I primarily mouse on the left side now (even though I’m right handed), and I will use the tablet stylus or other mouse on the right occasionally or for a change of pace. With the Wacom Tablets, you can use the stylus as a mouse, which is another way to avoid RSI’s (by switching between the mouse and the stylus). The neat thing is, you can use two mice in Windows by using two different types of mice with their controls managed by their own drivers. So, my MS Laser 5000 is managed by the MS Intellipoint driver and is configured for left hand use, and the Wacom Graphire is managed by it’s driver, and is configured for right hand use. That makes it handy for my wife, as she can just use the Wacom mouse on that computer, as she’s right handed (and prefers to mouse with the right). 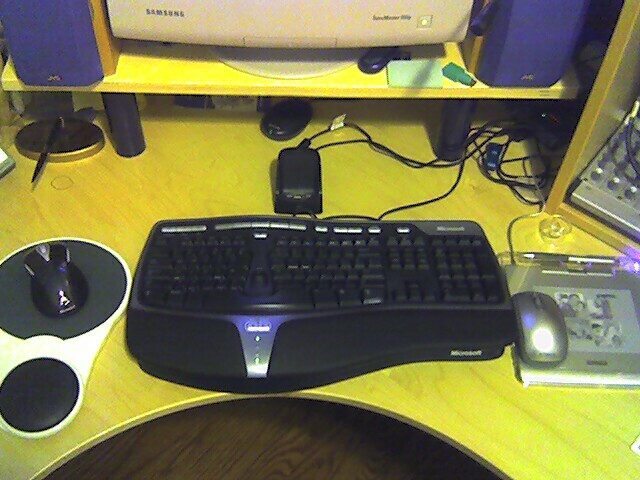 The same setup works in Linux(Ubuntu), using the Gnome control panel; the mouse is configured as a left-handed, and the Wacom is configured through the X-org.conf file as right-handed. This LifeHacker article is a good read for those thinking of switching their mouse to the other side. As for increasing you IQ, this article by the DumbLittleMan blog indicates that regular use of your non-dominate hand builds better ties between the two hemispheres of your brain, strengthening it’s development. At least that’s the gist of what I heard a Best Buy employee telling a shopper. The shopper was looking at this new HP TouchSmart “Family PC” and trying out it’s Smart Centre functions. It has a 19″ touchscreen, a Family Calendar, a message center, integrated TV tuner, webcam and microphone, and wireless keyboard, mouse and stylus. It runs Windows Vista, so it has the Media Centre functionality built-in. The shopper thought it was cool, but asked “Why would they make something like this?”. The Best Buy guy said that laptops are outselling desktops 6 to 1, and that most people are buying laptops as a personal item, no different than a PDA, cell phone or music player. He also said that even though some families have a laptop for each family member, they still wanted a “Family PC” for keeping shared files and media, so HP designed something that could go on a kitchen counter or family room table to fit those requirements plus more. The funny thing is, I recognized the truth and implications of that right away, because I’m going through a similar situation right now. I’ve built every PC I’ve ever owned from parts I’ve researched and found to meet my needs, so I get everything I need, and nothing extra I don’t. So, when my old desktop needed upgrading, I did the same thing, and just moved my Windows 2000 installation “as-is” to the new machine (it wasn’t quite that simple, but you get the point). And it’s a nice machine: Asus motherboard, 2GB OCZ RAM, AMD X2 2.6GHz processor, SATA II drive. It’s powerful, fast, and… I maybe get to use it a couple of hours a week if I’m lucky! Family life with two young kids does not lend itself to going to the home office and getting some stuff done on the desktop. That can only happen at nap times, or when they finally go to bed (at which point I’m so tired I probably want to go to bed too!). So, most of the time I use my Treo for computing work I need to do (which is what it’s intended for); for when I need more horsepower, I use VNC to my server, and run those applications there. It can get a little tedious after a while though, working with desktop applications running in a resolution of 1024×768 or higher, on a display 320×320 in size! As far as the “Family PC”; I think it’s a concept that will work well. As more and more of our daily interactions become digital, and the pace of our lifestyles increases, the calendar on the fridge just won’t cut it anymore. We’ve had a home server running in the house since 2003; it’s the central repository for all shared media and files, the mail server, HTPC recording backend, and a VNC terminal server (for access by my Treo, or for long running operations on a desktop application). It’s the hub of our home systems, as it’s accessible from everything from my Treo, to my desktop or my wife’s work laptop, to devices like the HTPC and the MediaMVP we use for viewing various media like TV programs and movies, family pictures and videos. I’m too much of a DIY person to run out and buy something like the TouchSmart (it’ll be more fun to try and replicate the same functionality using Open-Source components and my choice of hardware). But I can honestly say I can see it as the hub in many a household, tying together laptops, UMPC’s, PDA’s and smartphones, keeping the family organized and in touch in the coming digital era. Having something like this allows you to have a common repository for family information, as well as a common message centre. Imagine being able to forward VoIP voice mail (or Video voice mail), voice or video messages from family members, ink notes, or even the grocery list to a family member’s Treo, with just a few taps of your finger. Or how about making dinner arrangements, and having it entered into each family members calendar automatically, available when they next sync. The possibilities are endless; think your group calendars at work, but applied to the home and combined with the power of Internet Calendars. Apple could easily make something similar to the SmartTouch PC with a Multi-Touch iMac, an umbrella package like SmartCentre, and many of their existing software packages (iCal, Front Row, iPhoto, iTunes, Inkwell, etc). The desktop as we know it is dying in the home; it will become a niche market for power users, system builders, and gamers with the need for speed. Evolution is happening in the home, and the Family PC won’t look like it’s boxy brethren of old; slick new fashionable designs, combined with powerful user interfaces and family organizational tools will make this a pleasure to use, and more interesting than sticky notes and the calendar on the fridge that nobody bothers to read. 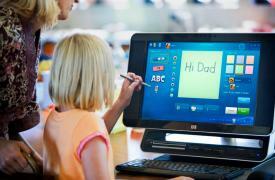 This new class of “Family PC” is huge; this may be a big step towards the Jetson’s home of the future. Originally posted to Palm Addicts here.